IF YOU want to gorge on chocolate this Easter without the guilt and self-loathing, former Big Brother reality TV star Jemma Gawned may have the answer. 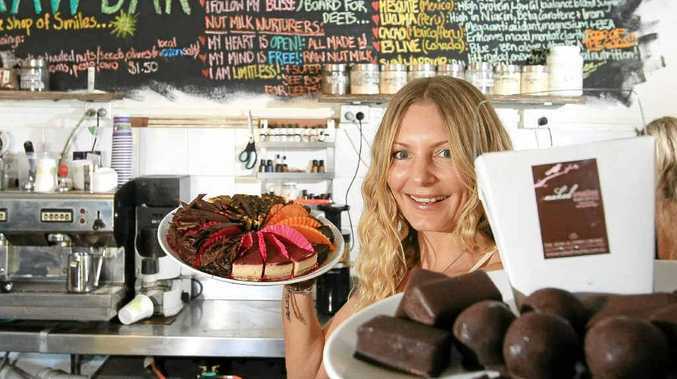 The 37-year-old, who moved her business 'Naked Treaties' headquarters from Melbourne to Byron Bay late last year, hand makes "healthy" chocolates and cakes which have a cult following around Australia. She may also be on the verge of cracking the international market with her "raw vegan, certified organic, gluten and dairy free" products attracting interest from the USA, Hong Kong and Singapore. "We get a lot of emails from people who are relieved to find something that doesn't upset their allergies or digestion and that tastes decadent," Ms Gawned said. She said it had taken 12 months to refine a recipe that resembled the snap texture and sheen of conventional chocolate bars while maintaining all the nutrition of the pure ingredients. Her unique process involved low temperature tempering, a precise ratio of cacao liquor, cacao butter, cacao powder and the natural sweetener agave and "injecting a vibration of love". Last November, Ms Gawned opened a retail outlet on Jonson St with her chocolate factory on the same site employing two full-time and three part-time staff. "It's really touching when kids come in and are excited about eating healthily," she said. 'Naked Treaties' has produced a bunny range for Easter, but the two biggest selling products were inspired by Ms Gawned's cravings for childhood favourites. Ms Gawned said she had been health conscious for a long time ("In the house I was fighting with Big Brother to give us decent food."). And six years ago she adopted a raw vegan lifestyle to fix some minor health issues. She began making healthy chocolates for her family and friends and when a Melbourne health store asked to sell them 'Naked Treaties' was born.